Jeff Vankooten encourages people to reduce the stress of uncertainty and thrive in disruption and change. He speaks on core competencies of resilience: communication, collaboration, adaptation, and imagination. He has been speaking publicly for more than 20 years and has keynoted more than 100 events. Jeff worked with a wide variety of public and private organizations in virtually every arena, from the tech sector to financial services, manufacturing, health care, hospitality, entertainment, retail, legal, and the US government. I would love to make a presentation to your group. Check my availability above. If your organization is struggling to stay relevant, is disoriented in the uncertainty of today’s business environment, or is operating at a baseline of low mood and morale, and your leaders want to know how to increase performance and energize motivation, they need to hear a live presentation by Jeff Vankooten. He has been described as a “crazily gifted communicator”, “riveting”, “hilarious”, and “the best of the best” by the audiences he has encountered. His presentation style is personable and entertaining and his content is substantive, compelling, and transformative. Audiences regularly remark on the conversations Jeff stimulated long after the event was over. 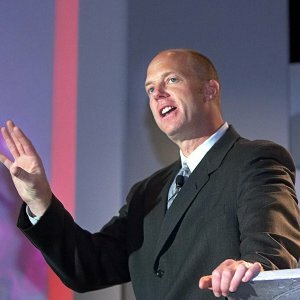 Whether you’re looking for an opening keynote speaker, closing keynote speaker or general session presentation, Jeff Vankooten delivers a tailored program that will exceed your expectations – guaranteed. Your people will walk away with actionable strategies they can immediately apply to strengthen their resilience and enhance your organization. He has authored three books; “Greatalk! Pithy Pieces of Advice for Astonishingly Effective Presentations”, “You are who you were when: Understanding our Generational Personalities”, and “Bounce Back and Thrive: Engaging Fear and Succeeding in a Shaken World”. He is a member of the National Speakers Association, a selective organization for recognizing and improving the gifts of professional speakers. Because of the increased life spans of today, there are now five generations alive today. Interacting today, as always, requires loads of relational savvy and deep commitment to one another to co-create the future. This keynote humorously explores our generational personalities to provide a better understanding of each other to relate more effectively. One of the more powerful, and effective ways to thrive in change is through a potent communication. This presentation takes you through six essential stages for preparing intentional messages that have an influential impact and get heard in a noisy world.